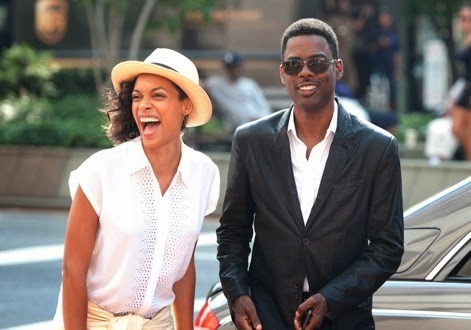 So, when I first wrote about Chris Rock's TOP FIVE, I kinda thought that it would be, you know, good. I mean, it's really hard to tell what a film will be based on its trailer, so I'm going to try to take this one with a grain of salt. But, in my head, I had souped up the film to be witty and smart -- indicative of most of Rock's comedy. Or maybe that's just too high of an expectation. It could be that the trailer reflects what you may already consider Rock to be, a successful comedian who's kinda stuck in a mid-career crisis, and not a more fresh comedy approach concept (or even something that moves away from both those things and builds off the tone of 2 Days in New York). In any case, it doesn't look bad, just...unexpected. Plus, it's filled with tons of star power like Kevin Hart and J.B. Smoove (both from BET's Real Husbands of Hollywood), Whoopi Goldberg, Cedric the Entertainer, Gabrielle Union and Rosario Dawson. So that's gotta amount to something. It actually kinda reminds me of Adam Sandler's Funny People, which I really liked (I know I'm in the minority with that). Wow Candice, I thought the trailer was terrific! I think the trailer is using the star power to get asses in the seats.